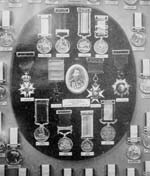 INCLUDED IN THE SHEESH MAHAL MUSEUM'S EXTENSIVE MEDAL COLLECTION ARE FIVE VICTORIA CROSSES. The Sheesh Mahal Medal Collection is located in the Sheesh Mahal Museum in the city of Patiali in the Punjab. 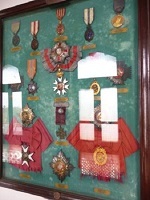 Over the years the museum has gained a reputation for denying access to the substantive medal collection housed in the building. However, rare images have recently been obtained by this website showing external pictures of the museum and more importantly a picture of the medal collection and the method of displaying its contents. A further image shows the case containing the Victoria Cross awarded to Private John Dunlay of the 93rd Regiment. Also in this case are three Albert Medals one of which is an Albert Medal ( Gold ( 1st Class ) Land ) which shows how diverse the medal collection is. ( select each image to enlarge ). The Sheesh Mahal Medal Collection was put together by Sir Bhupindar Singh, Maharaja of Patiala ( 1891 - 1938 ) in the 1920s, with the assistance of the auctioneer Spink of London. A few years ago the government of Punjab made noises about transferring the Sheesh Mahal Collection to the State capital Chandigarh, where the medal collection would be seen by many more visitors. However, it is believed that Amarindar Singh, the son of Yadavindra Singh, pointed out that the bequest in 1947 stipulated the collection remain in Patiala and threatened that any attempt to move it to Chandigarh would negate the bequest, and the collection would revert to to his private ownership. "Alma" - "Balaclava" - "Sebastopol"